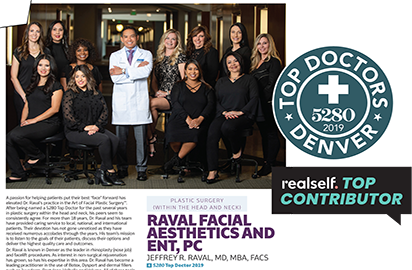 Rejuvenating non-surgical products (like Botox, Dysport, Restylane, and Juvederm) give Dr. Raval’s patients more control in diminishing signs of aging through regular visits without any downtime. How Much Better Can I Look? We all know that people get Botox and/or dermal filler injections so they can “look younger.” But, what does that mean? And what kind of results might you expect if you were to get one or both types of treatments? It’s one thing to learn about how Botox and Dysport or fillers such as Restylane or Juvederm work to minimize or prevent visible signs of aging. But the results can be darn hard to picture, especially since “better” is a pretty subjective concept. You can look in the mirror and know what you’d rather see, but will getting these injections produce those results? The best way to visualize what Botox and fillers might do for you is to look at our Before and After photos. As with all facial rejuvenation procedures, surgical or non-surgical, the key to happiness is realistic expectations. So the more photo examples you review, the better your understanding will be of the range of achievable results. Any set of Before and After photos can give you a general idea about results. But the most helpful examples are of people as much like you as possible. About your age and the same gender, for example. Certainly, you want to look for examples that show the area(s) of the face you want to change. Treatments that improve the appearance of crow’s feet may not be all that helpful if you’re concerned about those little “smoker’s lines” around your mouth. Injectables are nothing like surgery. Yet even with these treatments, it takes an artistic eye as well as skill and experience to produce just-right results. We’re talking about your face here – your first impression, and the first thing you see in the mirror every morning. We encourage you to do your homework, but we know you’ll be impressed with what you learn about Dr. Raval. Are You Ready to Move From Before to After? Rejuvenating non-surgical products are wildly popular with our patients here at Rocky Mountain Laser Aesthetics. These treatments give you more control in diminishing the signs of aging. Through regular visits, you can maintain your more youthful appearance over time. And there’s no downtime. Because we administer these products in very tiny increments, we are able to tailor the injections precisely to match the level of change you want to see, exactly where you want to see it. Entirely natural looking, entirely you, just “better.” And if you want even more pronounced results, we can add a little more. Botox and dermal fillers work differently to achieve results, but both work beneath the surface. That makes them excellent options to combine with skin rejuvenation procedures designed to refresh the skin’s surface. This is something you may want to consider discussing with Dr. Raval during your personal consultation. In fact, now would be a good time to schedule that consultation. We take pride in our expertise and professional here at RMLA, but we’re friendly and approachable, too. You’ll examine the “before” aspects of your face, and give you honest advice about what sort of “after” you can expect. You feel young and you’re healthy, so why not look that way, too? First things, first, though, as your Mom used to say. So don’t forget to scroll through our gallery of photos.